A uniquely practical DSP text, this book gives a thorough understanding of the principles and applications of DSP with a minimum of mathematics, and provides the reader with an introduction to DSP applications in telecoms, control engineering and measurement and data analysis systems. Assuming the reader already has some prior knowledge of signal theory, this textbook will be highly suitable for undergraduate and postgraduate students in electrical and electronic engineering taking introductory and advanced courses in DSP, as well as courses in communications and control systems engineering. 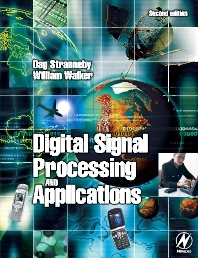 It will also prove an invaluable introduction to DSP and its applications for the professional engineer. Second and third year engineering undergraduates and postgraduate students in higher education.